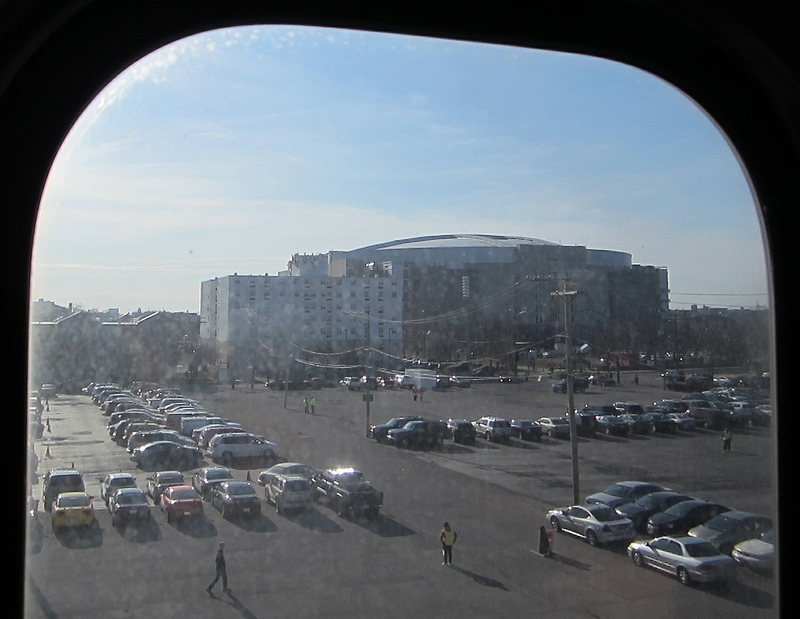 Every time I take the Pink Line to Pilsen and gaze out the window at the United Center, I’m struck by the apparent stupidity of train service that goes right past Chicago’s largest sports and music arena, but doesn’t stop there. The nearest existing stations, the Blue Line’s Illinois Medical District stop to the south, and the Pink and Green lines’ Ashland-Lake stop to the northeast, are both roughly twelve-minute walks to the stadium, long enough to discourage train use. But a new Pink station near Madison and Paulina would be a four-minute hop, skip and jump to the front doors. As it is, the land use around the arena encourages driving to Bulls, Blackhawks and Bruce Springsteen events. While Wrigley Field, next door to the Addison Red stop, is surrounded by bars and restaurants where fans can spend money after games, the House That Jordan Built sits in a vast moat of parking lots. Streetsblog USA, the national wing of the transportation news site network I write for, took notice and included the United Center in its annual Parking Madness bracket, a competition between asphalt atrocities. The stadium made it to the Final Four before being defeated by a parking crater in Jacksonville, Florida. In fairness, the Bulls are currently building a $25 million practice facility on one of the lots east of the arena, and they’ve proposed building a $95 million entertainment complex nearby. The funny thing is, there used to be a train stop near Madison/Paulina that served the arena’s predecessor, Chicago Stadium. According to the history site Chicago-L.org, the station was established in 1895 as part of the northwest branch of the Metropolitan West Side Elevated. The Madison stop closed in 1951 when the northwest line was rerouted to the current Blue Line route. The old station house was eventually converted to a hotdog stand, and it was demolished in the 1990s. In 2006, this stretch of track, known as the Paulina Connector, was activated again when the CTA created the Pink Line. However, spokeswoman Lambrini Lukidis told me the agency has no plans to rebuild the Madison stop. 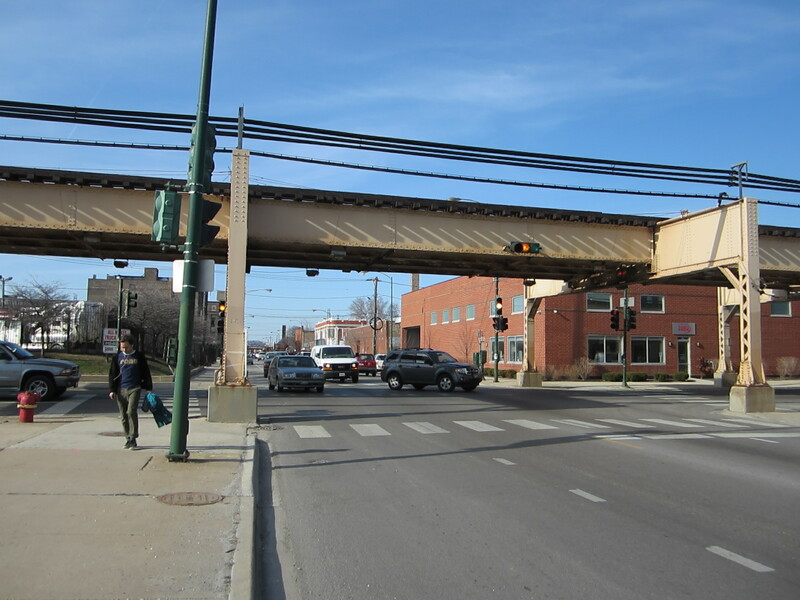 Local alderman Walter Burnett would also like to see a new station built near the Madhouse on Madison, but his preference would be for a Green Line stop at Damen and Lake, a seven-minute walk from the entrance, according to his assistant Reginald Stewart. That would also be useful for residents and people who work in the Kinzie industrial corridor, while the area around Madison/Paulina is sparsely populated. Along with the Damen station, Burnett wants a new Green Line station at Western, which would fill in the conspicuous 1.5-mile gap between Ashland-Lake and the California Green stop. Stewart says the ward has been lobbying the CTA on this issue for a few years, but funding is in short supply. The Green Line’s classy Morgan station, which opened in 2012, cost $38 million; the transit agency estimates a comparable station would cost $42 million nowadays. Steve DeBretto, executive director of the Industrial Council of Nearwest Chicago, which promotes economic development in the Kinzie corridor, says his group has been pushing for the Damen stop for more than a decade. Along with Burnett, DeBretto co-chaired the West Side think tank for the city’s Reconnecting Neighborhoods urban planning initiative in the late aughts. That study found there was only enough demand to justify one new station near the United Center, and Damen would get more ridership, but in the future, the new Pink station could be viable too. DeBretto says the Damen-Lake stop is a no-brainer. It would be right by the Fulton-Carroll Center, the ICNC’s small business incubator, which houses everything from carpentry workshops to a brandy distillery. “Out of 14,000 jobs in the corridor, 500 of them are under that roof, a stone’s throw from where we’d like to see the new El station,” he says. A new apartment building is opening across the street, and nearby employers like Standard Equipment, which maintains city street sweepers and garbage trucks, Schawk!, a commercial photographer, Goose Island Brewing and Intelligentsia Coffee Roasters, would also benefit. With interest in the neighborhood growing, DeBretto says the CTA needs to strike while the iron is hot. “The time to build the right kind of infrastructure is now,” he says. “If we’re able to build an El stop sooner than later, that will influence the kind of development we get, so that it’s transit-oriented, rather than car-oriented.” A new station that would encourage residents, workers and sports fans alike to take the train instead of driving would certainly be a slam-dunk.